Weather got you down? Heck, we’ve all been there. During the colder months in Paris, here’s how I conquer the blues and get back on track because “Even the darkest night will end and the sun will rise,” says my friend Victor Hugo. So get your mojo rising. Come hither. Pamper yourself. Just do it. There are certain hazy shades of winter in the City of Light that can wreck a gal’s complexion. So where do I go for some beauty SOS? Like the locals, I usually head to my trusted neighborhood pharmacist, and she’s never let my visage or mains down. Is there a beauty glitch or hiccup that can’t be fixed at the pharmacy? I don’t think so. Each time I enter a French pharmacy, the squeaky clean, powdered scent of the soap transports me back to my grandmother’s row house in Baltimore, giving me a strong Proustian dose of solidarity with both past and present. From floor to ceiling, the pharmacy shelves are typically stocked with a wide array of affordable and exquisitely packaged, plant-based soaps, shampoos, conditioners, lotions, crèmes, and cosmetics. After years of sleuthing in my pals’ salles de bains, I can honestly report that a healthy number of classic French produits de beauté are represented at the pharmacies. Grab the ball point pen. 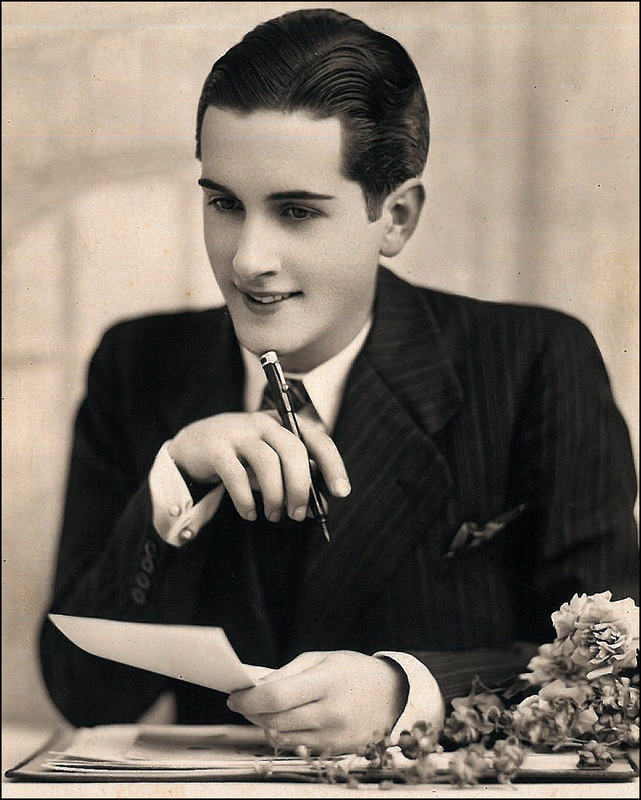 Keep your eyes peeled for family favorites like the blemish-fighting Payot Pâte Grise (1947), the soothing Embryolisse Lait Crème Concentrée (1950), and bars of Rogé Cavaillès Surgras Savon (1924). You’ll also find the ahead of curve Ella Baché Crème Tomate (1936), boxes of Roger & Gallet Savon Rond (1879), and the golden beauty Carita Fluide de Beauté N° 14 (1956)—just to name a few! Tip: Pharmacies are easily recognizable by their flashing green cross signs, dressed in neon and super cool LED. In each neighborhood at least one remains open through the night (and any closed pharmacy will post a sign directing you to the nearest one that’s open). Also, French pharmacists are licensed to diagnose and treat minor illnesses without doctors’ prescriptions. Look for the conseils pharmaciens sign outside on the shop’s window. Clipping Oscar Wilde yet again: “To love oneself is the beginning of a lifelong romance.” So why stop the dance now? Meet me at Sephora. Located on the Champs-Élysées, it’s one of my favorite spots in the city to get beautified in a pinch. A French superstar since 1969, it still flaunts a “backstage on opening night” vibe. Outfitted with a dramatic ramp, a red carpet, mirrors, and flattering lighting, the shop is a cross between a gigantic supermarket and a snazzy playground, with testers available for every product sold. Dig a scent? Ask for a free sample. They’ll happily prepare a one for you. Also, check out Bourjois. Difficult to find outside of France, they’ve been pushing their signature little round pots of “joy” since 1863. For the love of drama, even 19th century diva Sarah Bernhardt was a die-hard fan. Still in the mood for love? Don’t miss the Institute de Guerlain, located next door at #68 Champs-Élysées. Recently the century-old flagship was treated to a supreme makeover by dream team duo designer Andrée Putman and architect Maxime d’Angeac. Looking ‘S Marvelous once again, the spa boutique is now dressed to the nines in murals, mirrors, portraits, and painted furniture, along with plump leather chairs, mustard-colored velvet, and 350,000 teeny tiny golden tiles. From top to bottom, it’s a showstopper of Napoleonic proportions. Tip: Don’t be shy about testing the waters. Again, this is your chance to try fragrances that are difficult to find outside of France. But where to start? Flummoxed by all the choices? To help out, here are a few of my favorite Guerlain scents, along with the devotees who sprayed them. Jicky (1889) was created the same year the Eiffel Tower was built, and not only seduced Brigitte Bardot, Colette, and Sarah Bernhardt, but also Proust, Roger Moore, Peter Sellers, and Sean Connery, who was surely both shaken and stirred. L’Heure Bleue (1912) wooed both Catherine Deneuve and Wallis Simpson, who smartly paired it with Guerlain’s other classic, Mitsouko. Mitsouko (1919) was created in celebration of the end of WWI. Jean Harlow, Ingrid Bergman, Claudette Corbert, Charlie Chaplin, Anaïs Nin and Serge Diaghilev all took to its bold intensity. In fact, according to the rumor mill of the day, Jean Harlow’s husband, Paul Bern (MGM producer), sprayed himself with her Mitsouko just before committing suicide, only two months after their wedding. Now that’s lingering power. Vol de Nuit (1933) was created as a tribute to Air France and flyer Antoine de Saint-Exupery (author of “The Little Prince”). Aviators around the globe, along with Claudette Colbert, Marlene Dietrich and Katherine Hepburn, all found the scent of “Night Flight” heads above others. Its bottle even evokes an airplane propeller, captain. 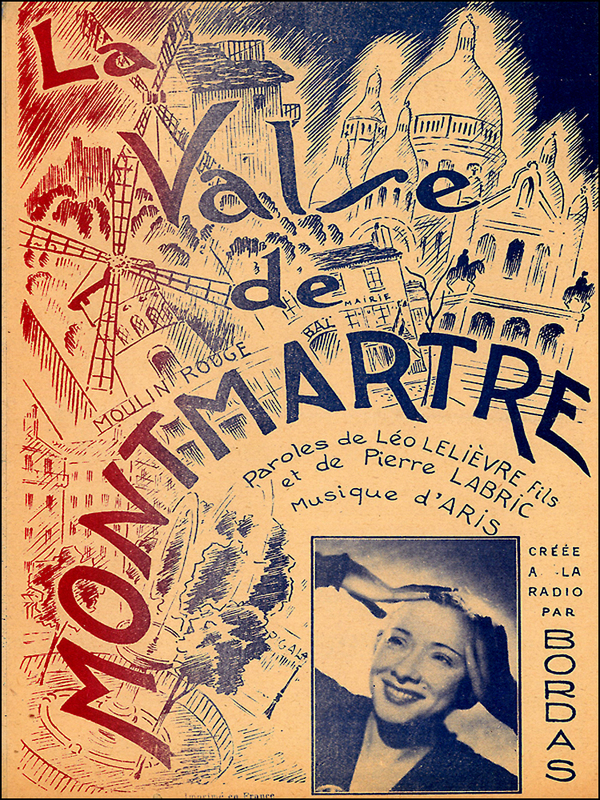 Now, with our sacs of powder puffs and magic potions, let’s head for the hills of Montmartre, and wind it back at the Chez Ammad at Hotel Clermont at 18 Rue Véron. Though located just a few blocks from the bustling Place Abbesses, you’ll spot nary a tourist in sight. And the beer is cheap. So let’s clank a few cocktails with sea merchants, tangled lovers, off-duty velvet-clad cabaret performers, artists, poets, and gypsy musicians, each with a cache of tales. Salut. La vie en rose! 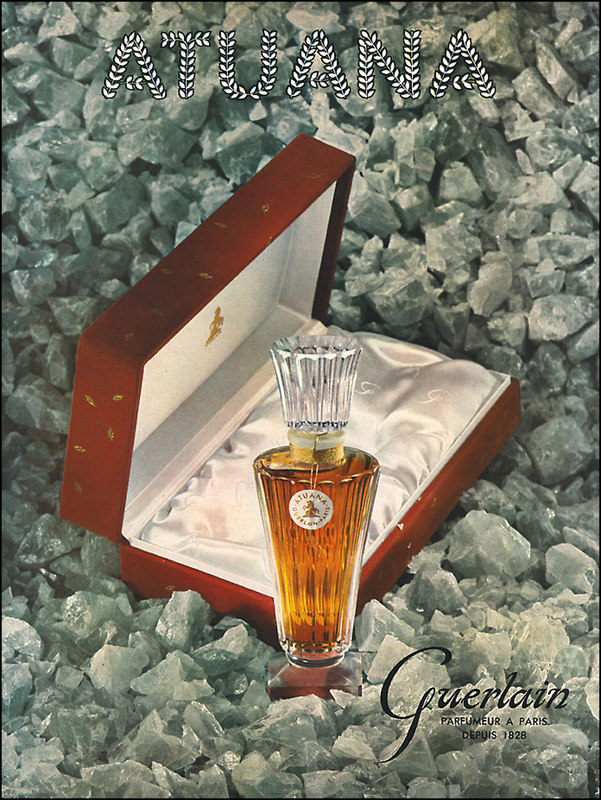 Ga-ga for more tales about classic French perfumes? Visit Lanier Smith’s Scents Memory. He meshes fragrances with the silver screen like no other. He’s a poet. And I am hooked. 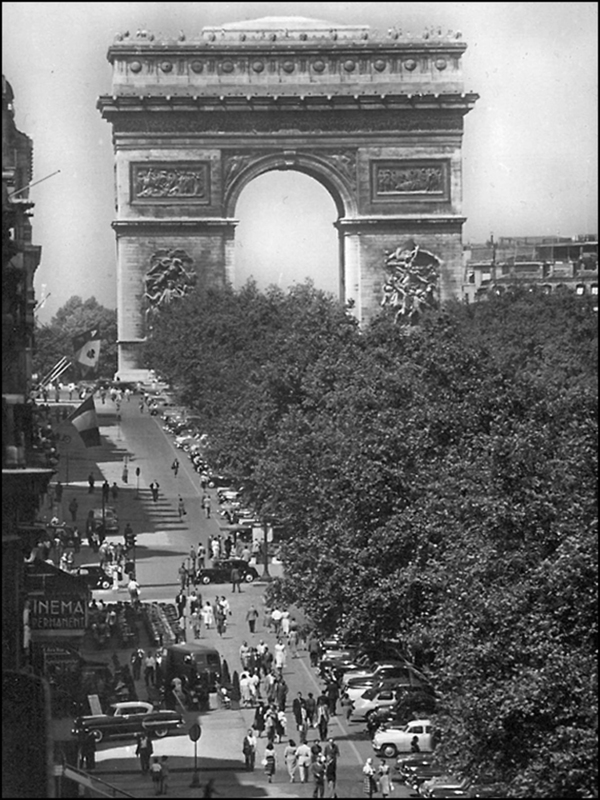 I want to step out down the Champs-Élysées in 1950, too. All those trees! Oh – and hello to sister Wendy! HA! Thanks for the giggle. My singing voice would have horrified Fred Astaire! However, the cats are digging it! T.
Those french know their perfume and fashion :). Would have been awesome to have been there in it’s cultural heyday! I wouldn’t say I have a favourite product, but everyone knows what Paris brings to the table when we talk about fashion and cosmetics! Thank YOU. Yes, I also love neon pharmacy signs. I’m constantly taking photographs of them. I have TONS of questions!! I’m waiting to turn the corner of “New Years” before I begin to have some serious fun in the planning phase, which I tend to obsess over! I am finding though that there is SOOO much information that I may get overwhelmed!! Is it ok to email you once I need to get serious about our trip planning….lodging…neighborhoods…etc…? This is exciting!! Yes, after the holidays, feel free to contact me at theadora . brack & gmail . com. Enjoy the weekend! T.
I love your articles Theadora. I was only thinking about you yesterday and I thought you must be due to post soon. Your writing is a feast for my soul – both the subject, the photos, and how you write it. You have a wonderful way with words that transports me to Paris, to all those wonderful sights and sounds and smells that you describe. I’m almost there with you. I’m saving all your articles for future reference. I’ll need to spend a month there!! So much to do and see. Bless you. Thanks for the reminder of what a pharamacy used to smell and look like. Now we have chains that sell plastic flowers, beer, laundry soap, mittens from china, plastic Santa’s, battery operated frogs that croak and any vitamin you want “buy one, get one free.” Boy have times changed. YES. I love the old pharmacies and drug stores, too. They’ve changed. I agree. The experience is not all the same. In Paris, there’s a pharmacy on every block in the city. Sometimes I’ll pop in one just for the smell of the soap. A fix! It’s heaven. Immediately, it sends me back to Baltimore. T.
Oh my goodness! Thank you so much for the plug Theodora! Buy the way.. You took me on a trip around Paris with your post. I loved it. Let’s meet in Paris and go shopping together. Lunch is on me at La Galerie des Gobelins at the Plaza Athenee! What a divine idea! I’m just CRAZY about Tiffany’s and La Galerie des Gobelins. And yes, I also adore your essays. Everyone should know about your work. That’s why I got on the horn. Say, did I just spot Elizabeth Taylor. BUtterfield 8, and John O’hara on your site today? Yes. Yes. YES. T.
Yes you did! The most desirable woman in town is the easiest to find….just call BUtterfield-8! Thank you again Theadora…I adora you! Paris is magnificent: past, present, and future – for visits there! I was there a few weeks ago and miss it already. I actually saw the film twice – loved it too! Ah, all these wonderful mysteries! I love your whimsical vision Theadora. Thank you! I must have walked right past Guerlain a couple of years ago. Not feeling glamorous at the time no doubt. Ended up looking in London for my favourite fragrance which I was told was discontinued. Will check at the source next time. Merci!! The Champs Élysée is a great stretch to promenade and people-watching. There’s so much to see. It’s VERY easy to miss the little shop. So sorry to hear about your discontinued fragrance. I hate when that happens. What’s the name of it? T.
It was Nahema. Many long years ago I bought myself the bath oil (which was within a young woman’s means). We were on another mission that day and walked out to Musee Marmottan (and back…). We are on the same wavelength Isadora! Thanks! Thank you! Showing off more flea market treasures. Guilty! T.
Yes, thank you for the morning tour of Paris … All I needed was a Citroen DS-21 Palas to complete the ride .. Loved the old postcard of the Champs, but it was sad to be reminded that once it featured an avenue of trees down the middle! Still, it all brought back so many lovely memories of when I was last there with my Sweetie! Thanks T! Sometimes ~ blushing wished I were a “she” :)… what a City? Unique, comment vivre ailleurs? Dear fellow beauty product maven, I agree! The experience IS first aid on the highest level. Everyone whispers inside the pharmacies. Sacred places! Do you have a favorite fragrance? I also love how folks hold on to their old (and sometimes empty) perfume bottles. They’re mystic tokens, landmarks, and sensual time-lines, I think. T.
I started wearing Chanel No 5 about 56 years ago. Although every once in a while I like to splash on a little Jo Malone Amber and Patchouli. ( I am one who holds on to empty perfume bottles. I put them in my lingerie drawers.) V.
Virginia, I received my first bottle of Chanel N°5 while I was in high school. One whiff and I was in love and felt so darn grown up and glamorous. I even wore in during the morning and afternoon. Heck, it was summertime and I was in my “flapper” phase. I still have the bottle. It was a hand-me-down gift from my Baltimore Aunt. And I loved it. Memories. . . Shifting gears, have you read Tilar Mazzeo’s “The Secret of Chanel No. 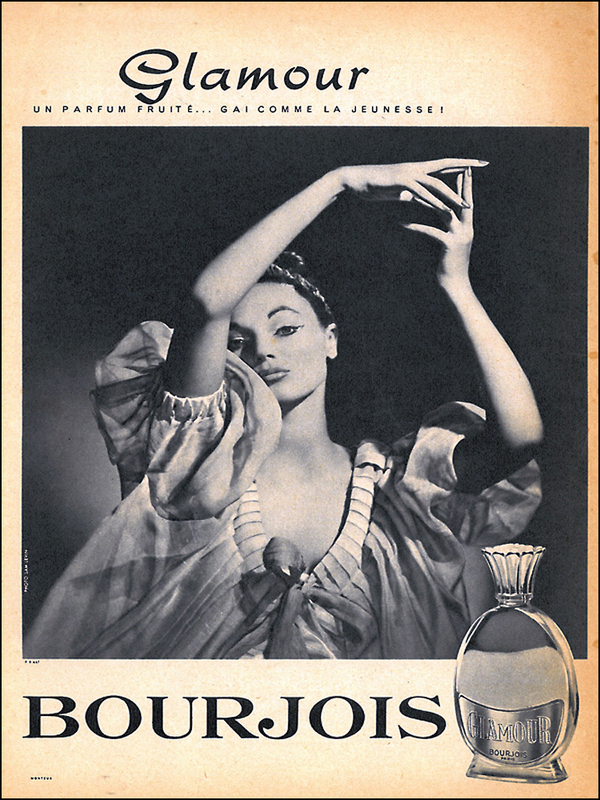 5: The Intimate History of the World’s Most Famous Perfume? Published in 2010 it’s an interesting read! Jo Malone. I need to spend some more time Jo Malone. I’ve always admired the bottles. Any recommendations? T.
Everything Jo Malone does is exquisite. Their candles – lit whilst you are languishing in a bubble bath – sends you into another world. I haven’t read the book but I have already ordered The Secret of Chanel No. 5! Happy Week-end T. V.
Adding Jo Malone to my list. Thanks, Virginia! t.
This is another winner of a post! I love the photographs and the stories (as always). Nothing is better than buying fragrance in Paris. I’ll have to go to the new Guerlain Flagship the next time I’m there. It sounds so elegant and over the top! Merci, NYB! YES. Add the Guerlain Flagship to your list. They also carry their cosmetics. I’m a big time fan of their lipstick. I’m a fool for golden packaging! By the way, I loved the recent shot of your Perfume Shrine. I was very impressed! Do you have a superstar in your collection? T.
Thanks! Yves Rocher Rose Absolute EDP and Tous Gold Bear EDP. Every time I wear Tous Gold Bear, I get so many compliments from people. Adding both to my list of scents-to-try. Thanks, NYB! Unfortunately, Yves Rocher Rose Absolute is discontinued. But they did come out with a Fresh Rose EDT that is very nice if you like the smell of Roses and Grass. Don’t worry, it’s not really grassy, but there is a fresh element in the scent. I quite like it and just bought a bottle. Tous Gold Bear is somewhat hard to find, but I’ sure you can get it in a Tous store. Great post, T – beautiful photographs, as always (caution don’t look at them while listening to For Now by Thomas Feiner – quite upsetting), and fascinating (did Paul Bern douse himself with Mitsouko to make a point or to make himself sweeter smelling in the afterlife/ after life?). Richard, I loved your question. I loved your music choice! I even re-read the post while listening to Thomas Feiner’s “For Now” tune. Whoa. Weird, haunting and very beautiful. 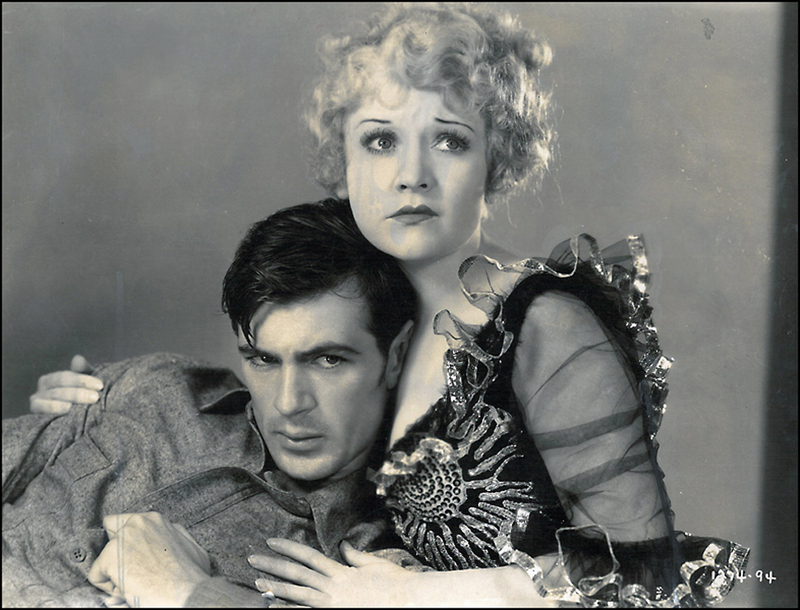 And speaking of the very first “Platinum Blonde” and Paul Bern, the suicide shooting occurred two months after the pair got married in July 2, 1932. I found the note. It’s quite sad. “Dearest Dear, Unfortunately, this is the only way to make good the frightful wrong I have done you and wipe out my abject humiliation. I love you, Paul. You understand that last night was only a comedy.” Sigh. T.
So glad you liked TF. The track’s parent album (The Opiates Revised) is rather grand. That note really is lump in the throat sad. Dear T’dora, How is it that you were able to send wafts of luscious scents via the web? You’re amazing! I have a long, long, long, but wonderful story about a Paris perfume adventure/mystery….maybe I need to write a blog about it on artteachtravel?? Hmmmmm…..thinking…. Goodness, Anita! So you have a long, long, long French fragrance mystery? All ears and eyes, I AM intrigued. Do spill and send us an “Art Teach Travel” link. Or give us the dirt here! T.
This was such a very exciting tour, Mlle B.! All the scents with their beautiful bottles, so marvelous! I especially liked your shot of the Evening in Paris lipstick tin…tres charmant! Love the old mag ads, too…so pristine and beautifully done for their time, weren’t they? Wish I was there…but almost am, every time I read your posts! Thank you! You’ll appreciate this. I spent more than a few hours trying to capture the little lipstick shot, after waiting hours for the early evening light. Brass is tricky. It’s a little soft but oh, swell. Do you have a favorite fragrance? I sometimes wear Estée Lauder’s “Private Collection.” I purchased my current bottle at Marshall Field’s (Macy’s) in Chicago about two years ago. It was an icy cold Saturday during the merry month of January. I had just attended an art talk at the INTUIT-Center for Intuitive and Outsider Art (One of my favorite museums in the world). The store was bustling but toasty warm. Whenever I wear it, I think of that magical day in Chicago. Each and every time. B. Love the image…and a ‘soft focus’ is very ‘in’, Babs! I have some sort of sensitivity to scents…over the years, some have actually caused dizziness and (ugh!) nausea, so I stick with my old fave–Chanel No.5, in its cologne form. It never fails to get a compliment, and why? Because I put it on only after my shower…and it gets absorbed into the open pores and any clothing I put on…then it stays for the rest of the day! Tres simple, oui? I’ve never visited Intuit, though I’ve been told to try and place some of my things there…perhaps I’ll hit it one of these days before “Joyeux Noel” sneaks up on us? So glad you know Chicago, but didn’t realize you’re a ‘Marylander’! Are the couple frequently shown in the 1950s Paris pics your relatives? Bonne nuit, ma chere…avec beaucoup des salutations! It’s coming along nicely…watch for more, Mlle B.! (but mine are not nearly as interesting as your Paris flea markets!). this post was TIGHT! Unbelievable! The pics are delightful and your prose is inspired. That line comparing the soaps to your grnadma’s rowhouse and “a Proustian dose of solidarity” was just beautiful. One of my favorite parts about travel is acquiring beauty products I can’t score here! The hours I’ve spent at perfumerías farmacías & cosmetics counters…well, if time were money, all the stuff I bought would be free! Well, thank you, doll! As always, I really appreciate your swell words. Bourjois is fun to collect. The cobalt blue “Evening in Paris” bottles are so pretty. The color really pops. Plus, they’re easy targets at the market. They had a real knack for naming their scents: Evening in Paris (1929), Mais Oiu (1938), Glamour (1953), Two’s Company (1953), Ga-Ga, (1953), Montmartre (1953), Frozen Assets (154), and Roman Holiday (1955)—just to name a few! de la Place de Clichy 87 on rue d’Amsterdam, 8th arrondissement (Métro: Place de Clichy). Open since 1880, this old-school shop is definitely worth the trek. What did you think of Lubin’s 2011 remake of one of Marie Antoinette’s scents? I think it’s called “Black Jade.” Did they “toy” with history? Ahhh! I wish I was in Paris or at least Europe right now. (Actually I feel that way like 92% of the time…) I only enjoy shopping in Europe. I guess cos there’s lots of walking, window shopping, and always a bar to pop into between facing those throngs of people. I was unaware of “Black Jade”! Now it must be smelled! How would you describe it? Is it floral or one of those powdery scents like Chanel no. 5 that just reminds you of Grandma’s neck? Most of my scents aren’t of the vintage variety, as far as I know. I started wearing Amarige de Givenvchy when I was still in college and now almost every one I know associates the smell with me. (Still my husband’s favorite even though I try to mix it up nowadays.) I’d love to smell those Boujois perfumes. Did you know they’re just the “little sister company” of Chanel? Supposedly their powders are identical. Favorite cosmetics? Golly, that list could go on and on. I’m like a kid in a candy store with that stuff! Guerlain, definitely. Chanel is always a favorite, their foundations are actually different shades in Europe than they are here. If I want to use their products I have to buy them on the right side of the Atlantic. “Cameo Clair” is definitely not the same shade in the US. Booo! Yes, Chanel and Bourjois have a long and complicated (yet interesting!) history. At one point, they were using the same noses! I haven’t tried “Black Jade” yet. I’ll keep you posted. I’m still snooping. . . T.
Thank you for the wonderful stroll down memory lane…and it would seem beauty runs in your family! Hands-down, this is my favorite comment. (tee-hee) Thanks, Paul! T.
I have been pushing for a trip to Paris next summer – this really makes me want to go! An absolutely stunning post, I looked at your images for ages…………..
As always, thank YOU for your sweet words. It was a fun post to create. Next stop: Palais-Royal! What happens at the Palais-Royal stays at the Palais-Royal. Oh, la la. Enjoy the week! T.
Love the red hat in the ad! I also love the red hat. It’s a great bonnet. Sadly, the designer is not listed in Coty ad. I searched and searched! T.
Your wonderful post reminds me of all the empties I have stashed away of L’Heure Bleue – I can’t bear to throw them away! That Bourjois “Tempt me Pink” with the Promise of an Evening in Paris is too tempting. Oh my gosh I so hope you and Lanier get together one day soon in Paris. What a team, what a dream! Oh this post is divine. There is no problem a trip to a Parisian apothecary can’t solve. If you’re ever in Chicago, visit the Merz pharmacy there. I spent a good 2 hours there spritzing and powdering.